I have a degree in linguistics, and I don’t use it for anything, so I give you an article about words so that I feel the debt my family went into to put me through college is justified. 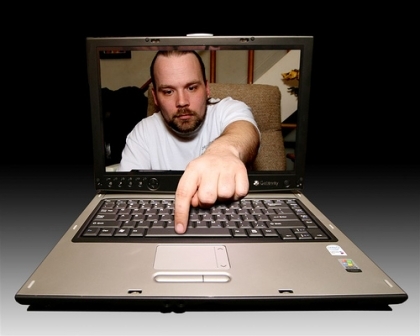 The latest complaint to come out of the tech community is use of the word, “techie” (see photo above) to describe individuals who work in the technology industry. Sounds pretty harmless, right? WRONG! I’m sorry to tell you, but using this word makes you worse than Hitler according to people interviewed in a recent San Francisco Chronicle article. Hitler may have killed millions of people, but he would never stoop so low as to refer to someone by an innocuous term that no one even knew was offensive. Okay I’m being dramatic, but my point is that I don’t think the term “techie” is as big of a deal as some are claiming, and ultimately it doesn’t matter anyway. Now, of course I believe words are important. Imperative and paramount, even. You can find me silently searching for the right word to express myself unaware that my friends have moved on to other conversations, and possibly other locations as well. Certain words have the ability to carry with them centuries of meaning, giving them a power one could not imagine to be attributed to a series of technically-arbitrary phonemes. 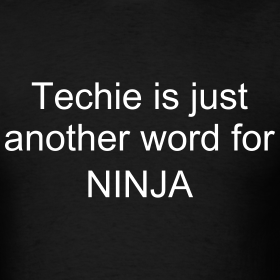 Techie is not one of those words. Let’s ignore the fact that the journalist who wrote this had to dig to the bottom of the (coffee) barrel to find people who have a strong opinion on the word “techie.” In reality, true entrepreneurs don’t have the bandwidth to waste on this brand of nonsense. People who are trying to change the world do not sit around trying to project what strangers think of them based on word choice. Those who are offended by the name “techie,” are likely to embody the negative characteristics that they perceive to come with the term, in that they don’t give back to the community that’s making them wealthy, they have no awareness or concern of their impact on people around them, and their end-goal is to create a profitable business rather than a fantastic product. And why focus on the individual word – isn’t the connotation the important part? Whether you’re called a “techie,” a “hacker,” or a “raging douchebag,” what matters is what the speaker means. If you don’t like the implications of a word, chances are you identify with the negative components of its perceived definition, which in this case is not a definition that everyone has collectively agreed upon. And if we are going to spend time worrying if our words hurt others, perhaps there are other minorities besides wealthy, elite software engineers that deserve that energy. Though the SF Chronicle article does posit that the current struggle for non-discriminatory terms is THE SAME as the struggle experienced by Mexican immigrants, so it’s possible I’m misguided. Maybe instead of focusing on whether or not a word qualifies as pejorative, we can turn our energy inwards and ask ourselves if we are exemplifying the kind of entrepreneurial spirit that has paved the way for us to be able to sit in a coffee shop on a weekday with glorious machines at our fingertips. If the answer is that you simply don’t want to be thrown into this ideal that strips you of your individual identity then make the world know who you are. Show them that a techie is not just a follower, but an innovator, someone who thinks about the problems of the world and how to fix them. Labels don’t matter. What you do matters.